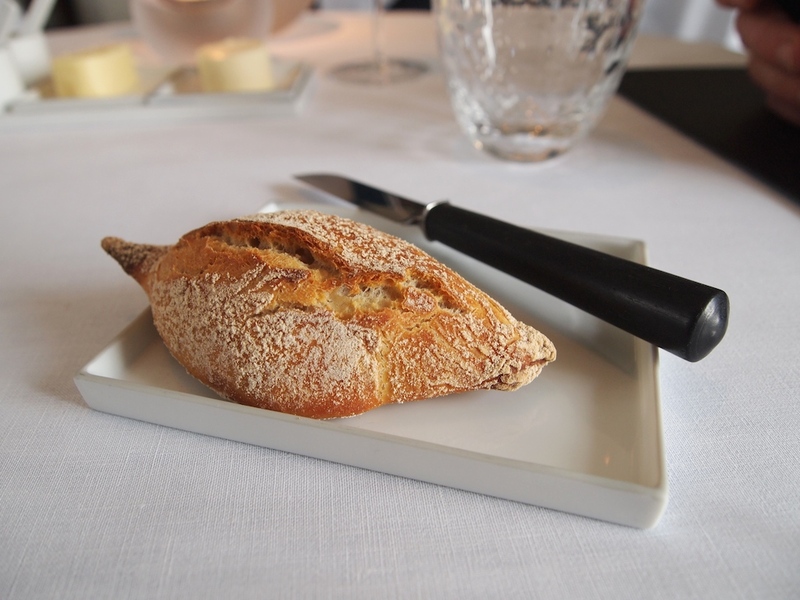 Once a simple brasserie serving traditional Belgian food, Hof van Cleve is now widely recognised as one of Belgium's gastronomic greats. Chef-owner Peter Goossens (b. 1964) started his career at a Belgian catering college in Koksijde, after which he continued this training in Paris, working in a number of Michelin-starred kitchens, including the then two-starred Le Pré Catelan. When he returned to Belgium in the mid eighties, he got a position at De IJzerberghoeve (then 1 Michelin star) in Kruishoutem. The owner of De IJzerberghoeve also owned the Van Cleve farm up the road, which he sold to Peter Goossens in 1987. The sale and purchase agreement included the condition that he would not establish a fine dining restaurant there for 5 years - hence the simple brasserie beginnings. Evidently things changed in 1992 and the restaurant really took off from there. In 1994 it was awarded its first Michelin star, a second followed in 1998 and ten years ago, in 2005, the restaurant received its third star. 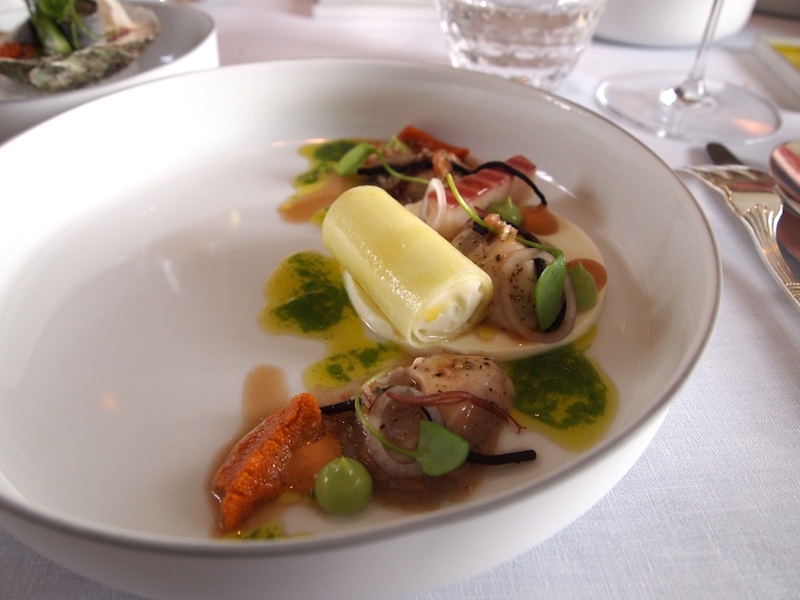 Hof Van Cleve has also featured in San Pellegrino's Worlds' 50 Best Restaurants list for an impressive nine years, its highest position on the list being number 14 in 2007. In the 2014 edition they were at number 45. Hof Van Cleve is open for lunch and dinner Wednesday through Saturday. 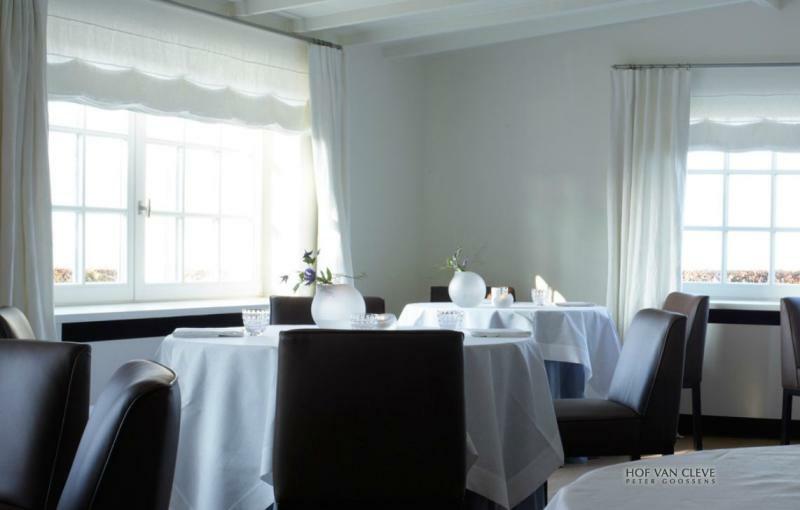 The restaurant offers a "Frisheid van de Natuur" (Freshness of Nature) tasting menu (5 courses €205, 7 courses €255), a vegetarian "Veld, Tuin en Bos" (Field, Garden and Forest) menu (7 courses €215), an a la carte menu and at lunch there's also a daily-changing "Marktwandeling" (Market stroll) menu (4 courses plus amuse bouches and sweets for €135). 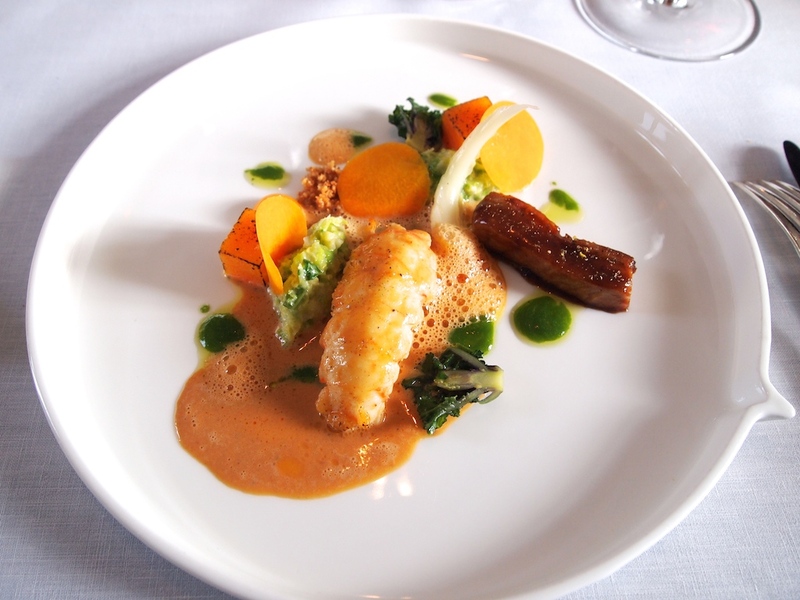 I had lunch with my husband and a friend at Hof Van Cleve on Friday 6 March 2015 and we all ordered the 7 course "Freshness of Nature" menu. Lunch started with five amuse bouches. 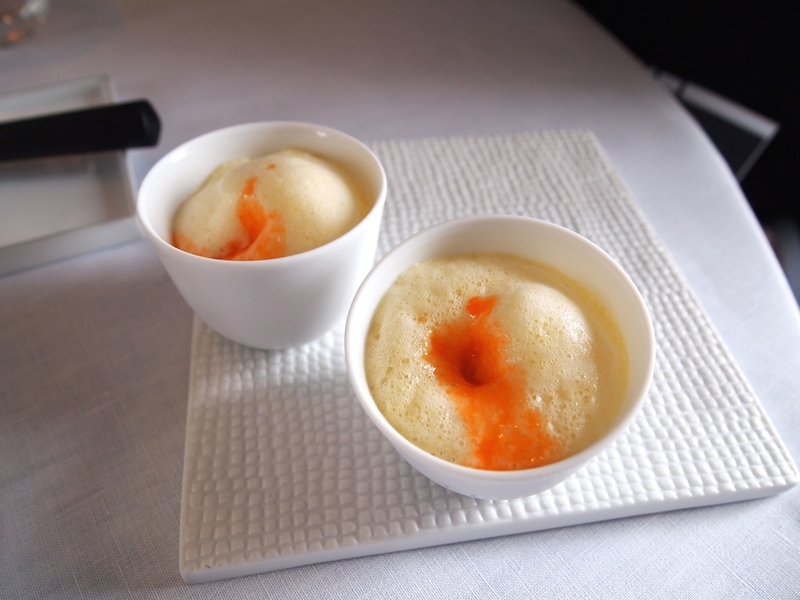 First up was a ginger, bergamot and coffee foam onto which a velvety and intense, and beautifully seasoned carrot juice was poured. A very pleasing combination with lovely bitters in the aftertaste. 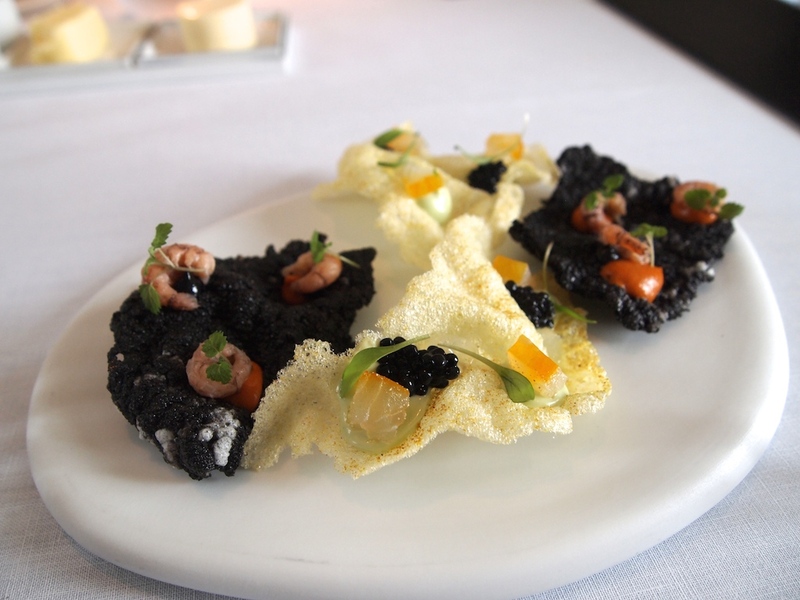 Shortly after, two crisp crackers arrived, one flavoured with curry and topped with smoked haddock, caviar, avocado créme and a citrus gel, and the other one flavoured with squid ink and topped with grey shrimps and some pungent romanesco puree. Two delicious crackers with refined, contrasting flavours. Next was a satisfying medley of marinated salmon, burrata, a light sesame puree, wakame, thinly sliced radish, enoki mushrooms and sesame seeds, served with a warm miso broth. 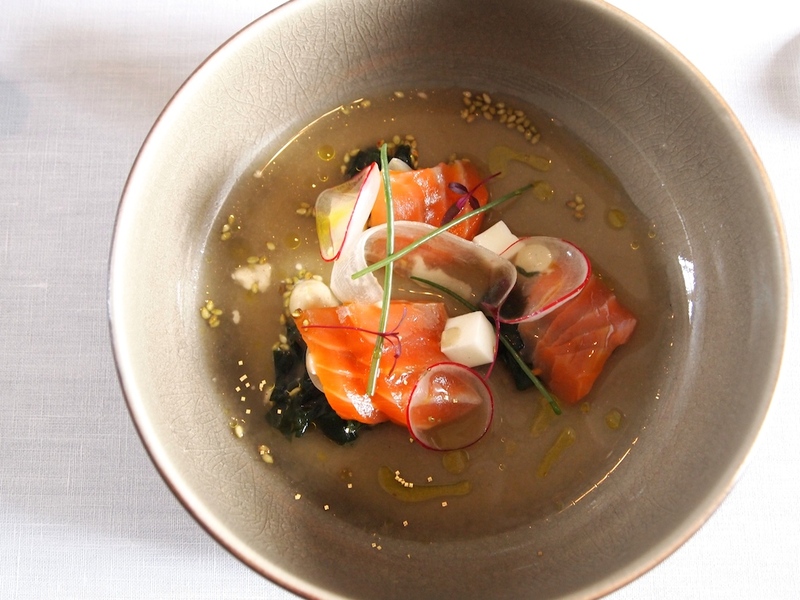 A wonderfully elegant dish with balanced sesame flavours, great textures and the quality of the salmon was first-rate. 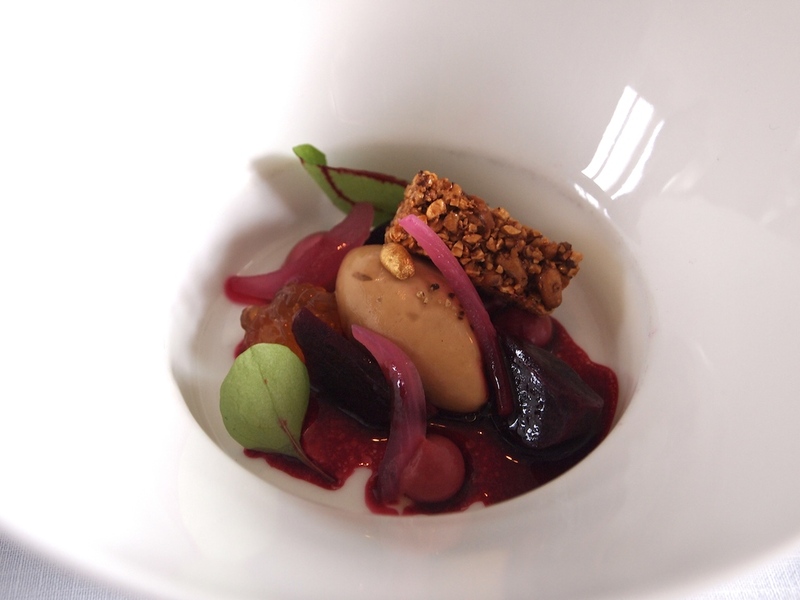 Equally good was a smooth chicken liver parfait, served with tender beetroot, beetroot puree, beetroot vinaigrette, pickled onions, a nice and wobbly chicken jelly, and a miniature grain bar. A delightful dish with just the right amount of sweetness and acidity. Wonderful contrast of textures too, particularly the crunchy grain bar. Last in the amuse bouche line was a perfectly formed oxtail cannelloni, served with a celeriac flan, poached quail's egg, black truffle (sliced and puree), and truffled oxtail jus. Lovely moist and succulent oxtail meat and the addition of the poached quail's egg brought extra richness and creaminess to the dish. Shortly after, the first course of the Freshness of Nature menu arrived. 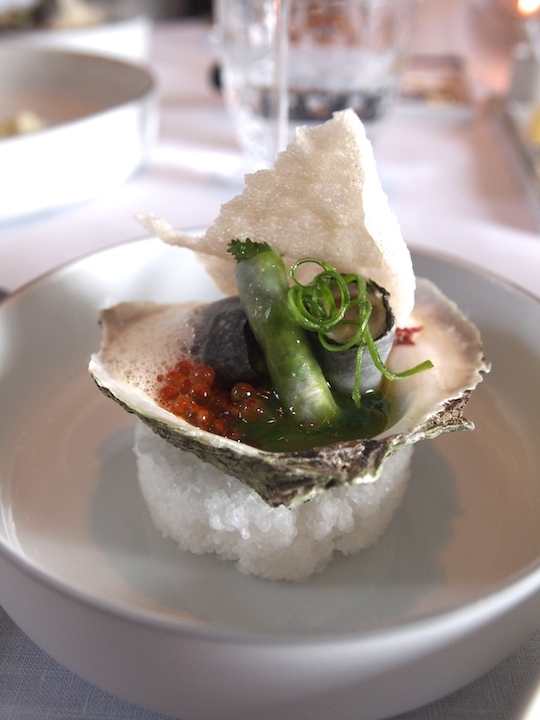 Three plump Zeeland oysters were served with a horseradish flan, a parsley coulis/dressing, avocado (puree and crushed), smoked eel, some sea urchin (roe and puree), and a crisp apple cylinder filled with a beautifully fresh and tart apple and bergamot ice cream. A nice and sharp shallot vinaigrette (made with aged vinegar) was spooned over tableside. A dish of sheer beauty that stopped me in my tracks. Sensational oysters, fleshy, briny, nutty, with an incredible, long aftertaste. The horseradish flan was wonderfully elegant, with just the right balance between creaminess and heat, enhancing the flavours of the oyster perfectly. 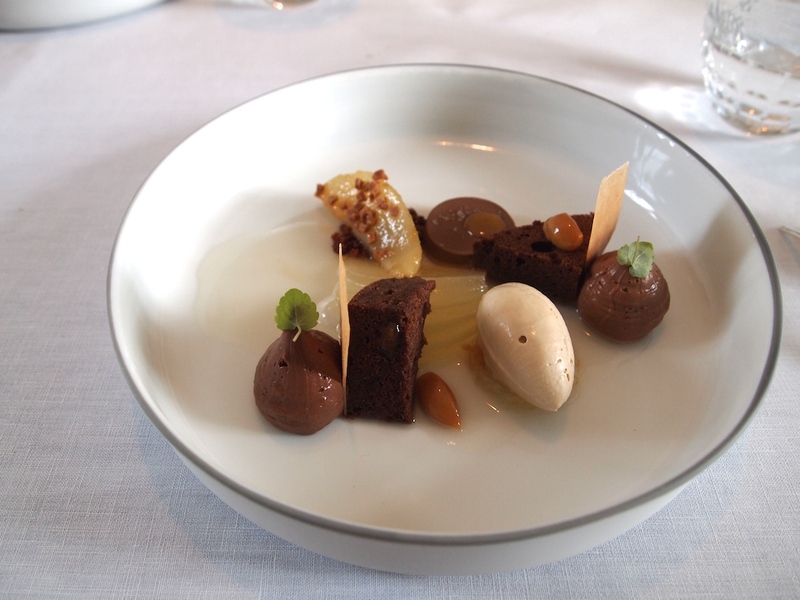 Highlight of this dish was the apple and bergamot ice cream - so pure, so balanced. Alongside this, we were served a gently heated oyster wrapped in nori, accompanied by algae puree, pink seaweed, trout caviar, oyster foam, an oyster cracker, and a terrific mini white radish roll filled with fresh herbs such as coriander and chervil. The temperature brought a wonderful creaminess to the oyster, making for a completely different flavour/texture experience. Precision and synergy, all in the tiny space of an oyster shell. 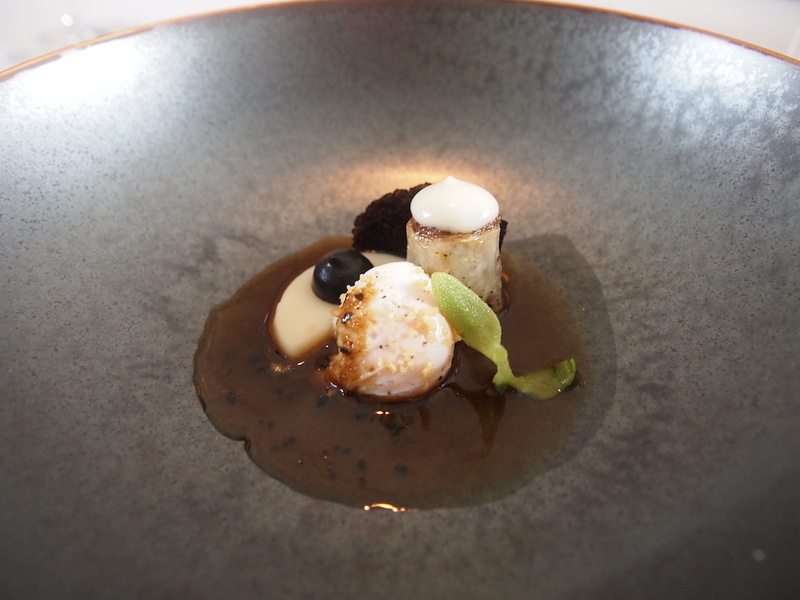 Second course was grilled scallop (from Saint Brieuc), excellently paired with various forms of salsify (chips, puree, braised), a mushroom "escabeche", a Mimolette cheese créme, confit chicory, a concentrated but refined charcutière sauce, and a creamy sauce flavoured with Vermouth. 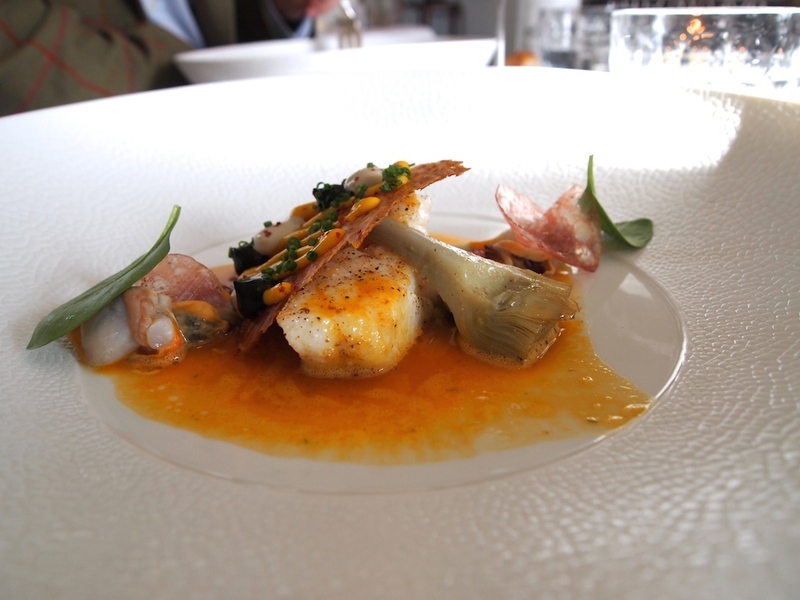 A wonderful dish with rich, complex flavours, primarily the extraordinary bitters of the chicory and the nuttiness of the mimolette. All this was cleverly balanced by the acidity of the mushroom escabeche. 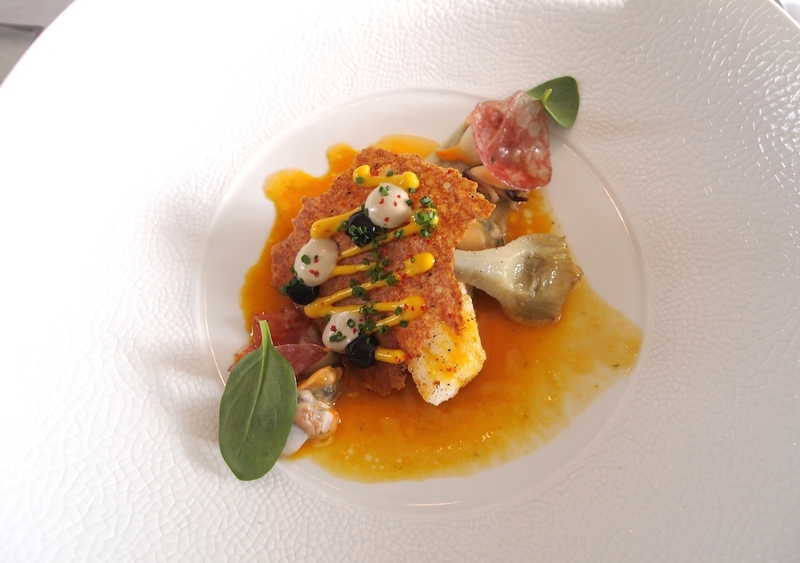 Next up was beautifully cooked turbot placed on top of some fregola and complemented by a light Bouillabaisse sauce, that had elegant but distinct fish flavours. 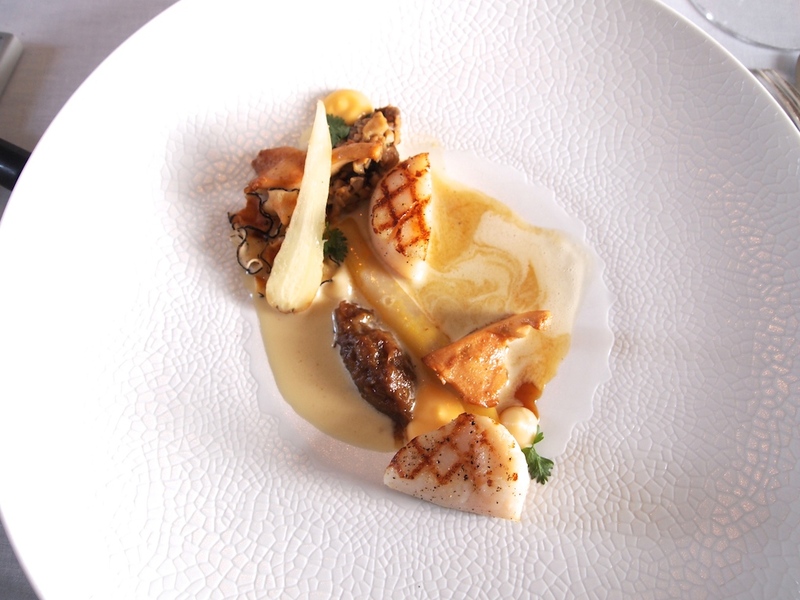 The turbot was accompanied by some juicy clams and mussels, a piece of tender artichoke, some artichoke puree, a citrus puree, thinly sliced chorizo, and a thin potato crisp topped with black garlic puree, artichoke puree and rouille. A great collection of distinct ingredients and flavours that stood out because of their splendid balance and harmony - the citrus puree added a little zesty kick. Fourth course was an indulgent pairing of sweet and succulent langoustine (from Guilvenec, Brittany) and moist lacquered pork belly; around it were quenelles of creamed, finely chopped cabbage, langoustine "crunch", flower sprouts (a cross between Brussels sprouts and kale), butternut squash (roasted cubes and pickled slices) and a few drops of watercress and hazelnut dressing. A brilliant combination of ingredients providing a rich and round experience, both in flavour and texture. Particularly impressive were the beautifully prepared vegetables. Nice subtle crunch from the pickled pumpkin, loved the roasted finish on the pumpkin cubes and the green cabbage was simply sensational. More gastronomic excellence followed. Meltingly-tender pigeon with a consistent colour all the way through, and a juicy pigeon leg, were served with a smooth and round Jerusalem artichoke puree, two delicious chickpea croquettes, watercress, roasted Jerusalem artichoke, braised shallots, and mushrooms. 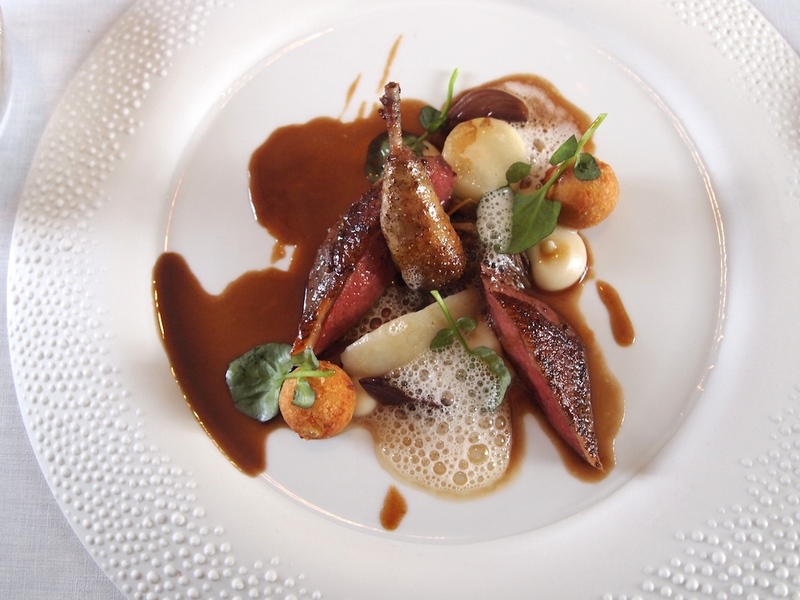 All this was finished with an outstanding, well-reduced pigeon jus, delicately flavoured with sage, and a light and creamy mushroom foam. Pigeon served and savoured in its most exquisite form; the few leaves of fresh watercress adding just the right touch of lightness. One of the finest pigeon dishes I have ever eaten. Time for dessert. 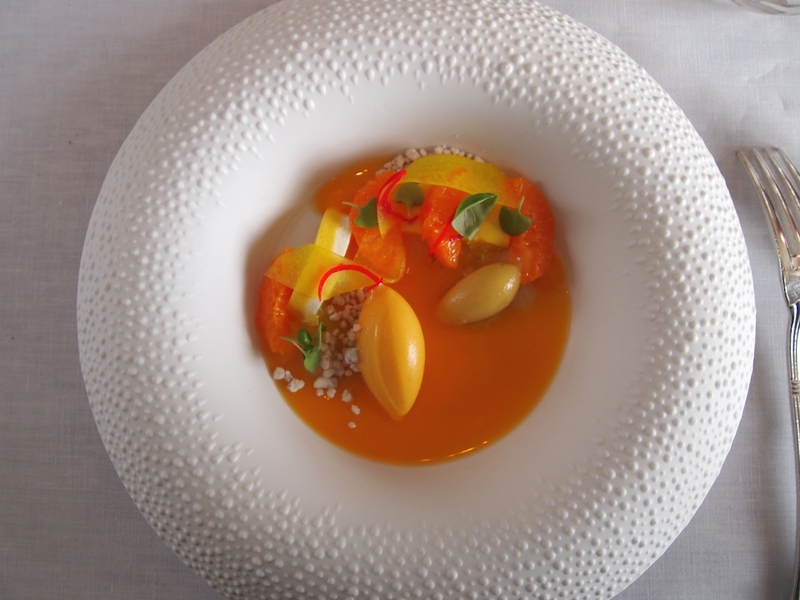 First a visually stunning dessert of sharp sea buckthorn sorbet, accompanied by a banana and passion fruit sorbet, delicate mandarin segments, a mango-vanilla flan, white chocolate crumbs/crunch, a thin ribbon of marinated citron, and garnished with a few baby basil leaves. Best of all was the pure and vibrant bright-orange mandarin sauce. A perfectly executed, seductive dessert with delightful textures and knock-out sweet and sharp flavours; pure magic for the senses. A chocolate and pear dessert followed. Carefully arranged on the plate were pieces of dark, brownie-like chocolate cake, a delicious nougat ice cream, a chocolate flan topped with salted caramel, some dulce de leche, creamy chocolate mousse, fresh marinated fanned pear, a gorgeous warm (poached) pear sprinkled with some chocolate crumble, some peanut crisps, and a clear pear sauce elegantly flavoured with Poire Williams. Not such a powerhouse of a dessert as the previous one, but still sublime and the addition of salty ingredients was a fantastic flavour enhancer. 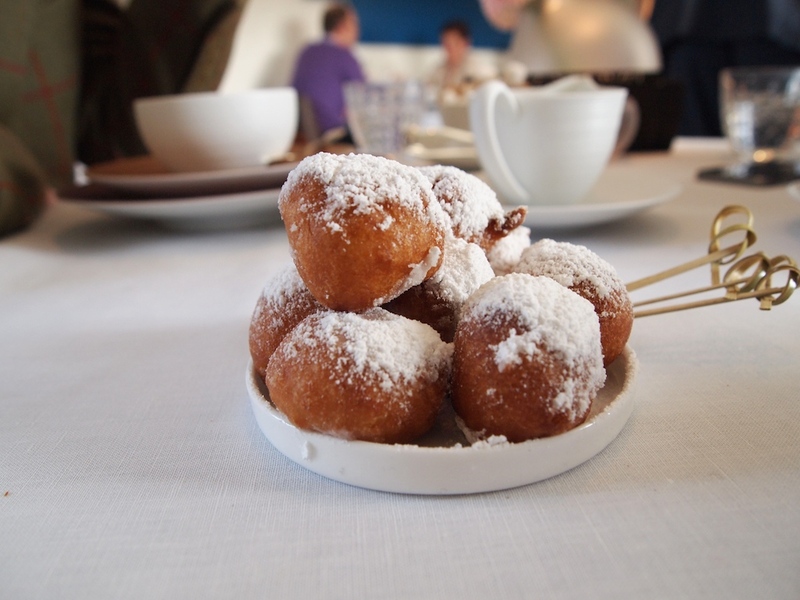 The sweet ending of our meal was tremendous, both in quality and style, and included Hof Van Cleve's signature mini "oliebollen" and a fabulous trolley with homemade sweet treats, including apple tart, tea cakes, marshmallows and macarons. "Humans are suspicious and jealous creatures. When they see something perfect, they want to find a flaw." (Gosho Aoyama). Some people warn us not to confuse excellence with perfection because perfection is the business of the Gods. However this may be, I could not find a fault today. Peter Goossens is a chef who is deeply committed to Belgium's culinary heritage and to its seasonal produce and that of nearby France. The menu is loaded with ingredients of the finest pedigree and every dish is made with impeccable craftsmanship and precision. The marriage of modernity and classicism is so perfect that one cannot help but feel that Goossens has taken the maxim of Coco Chanel to heart: "Innovation! One cannot be forever innovating. I want to create classics". There were dishes in this menu, so subtle and layered, that they played my tastebuds as if they were the keys of a piano, and they filled with me a sense of astonishment. 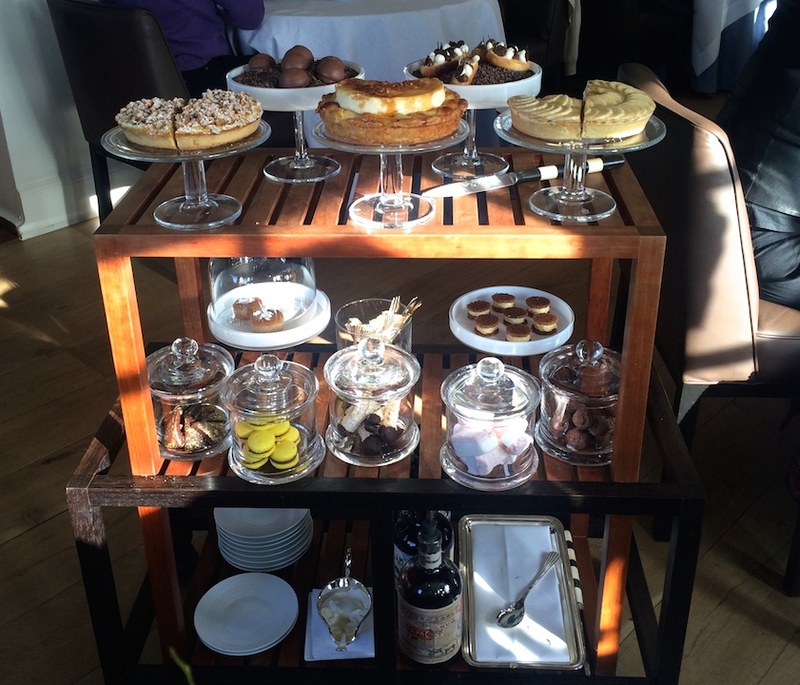 Service was in the capable hands of Serge Sierens and Lieve Goossens and their team, who all did an excellent job. I had entered the gastronomic universe of Peter Goossens before (2011 review), but today I encountered him in a different galaxy.